Marsaxlokk are up in arms over the decision by the Malta FA's Board to Investigate Corrupt Practices to demote the club to Division One for match-fixing. The former Malta champions were on Friday thrown out of the Premier League and fined €4,000 after Peter Hartshorne, a former Marsaxlokk official and assistant coach, was found guilty of offering a bribe to Matthew Camilleri, the then Msida St Joseph goalkeeper, before a league match in November last year. At a news conference yesterday, Ian Spiteri Bailey, the club's lawyer, spoke at length about a number of points which, he claimed, violated the principles of justice and compromised the defendants' rights during the trial before the MFA board. "I'm not going to assess the merits and details of the sentence because we still consider this case to be sub judice," Dr Spiteri Bailey said. "What I intend to do is to address certain issues in a generic mode." While emphasising the club's stance against all forms of anti-sporting behaviour, Dr Spiteri Bailey insisted that Marsaxlokk are clear of any act of corruption and this is why they have lodged an appeal against the punishment handed to them. Dr Spiteri Bailey said that, irrespective of the magnitude of the anti-corruption drive in football, the rights of entities and individuals during disciplinary proceedings must be safeguarded. 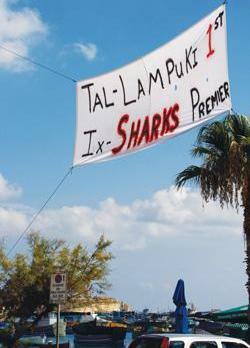 "The rights of Marsaxlokk FC were compromised during this process," Dr Spiteri Bailey said. "The least one can expect, in such circumstances, is for the fact-finding exercise to be profound and rigorous but this was lacking in the MFA disciplinary process." The Marsaxlokk lawyer alleged that the club encountered a number of obstacles in their quest to uncover the truth. He described the Malta FA rules as draconian, adding that he was assuming responsibility for his strong comments. Holding a copy of the sentence, Dr Spiteri Bailey complained that the board failed to decide on a number of preliminary exceptions put forward by Marsaxlokk's legal team at the start of the trial, including the admissability or otherwise of the testimony given by Inspector Angelo Gafa during the court proceedings against Hartshorne. "The club didn't have the opportunity to examine Insp. Gafa's evidence," Dr Spiteri Bailey said. "My intention was not to counter-examine Insp. Gafa, I only wanted to ask him a number of questions on various points." Marsaxlokk also argued that the MFA didn't have the right to obtain a copy of the criminal proceedings against Hartshorne and Claude Mattocks (the former Marsaxlokk player who has also been convicted for his part in trying to bribe Camilleri) because the Magistrates' Court has yet to rule on the association's request to appear parte civile. Dr Spiteri Bailey claimed that Marsaxlokk's right to a fair trial was undermined for the simple reason that the Board to Investigate Corrupt Practices was made up of a number of people whose function was "dubious". According to the Marsaxlokk lawyer, these individuals wore different hats during the entire process as they acted as "investigators, prosecutors and judges" of the same case. Dr Spiteri Bailey also contested the board's assertion that it is 'autonomous and independent' of the Malta FA, saying that the board can never be autonomous because it is bound by the rules and the statute of the association. Dr Spiteri Bailey also mentioned Insp. Gafa's trip to Nyon for the draws of the UEFA club competitions in June. According to the Marsaxlokk lawyer, Victor Sciriha, the president of Valletta FC, testified that Insp. Gafa was accompanying the officials of Sliema Wanderers and that his accreditation to attend the draws at the UEFA headquarters had been provided by Birkirkara FC. Quoting parts of the sentence, Dr Spiteri Bailey told those present that the MFA board expressed concern about Insp. Gafa's presence at the UEFA draws in light of his central role in investigations into other allegations of bribery in local football matches. Last month, Marsaxlokk filed a judicial letter, claiming that on several occasions, it summoned Insp. Gafa to appear before the Board to Investigate Corrupt Practices but he never turned up. In his letter, Insp. Gafa said that he had sought his superiors' consent to attend the sittings of the board but this was not given. Robert Micallef, the Marsaxlokk FC president, said that his club was victim of injustice. "Under my presidency, this club has always done its utmost to act responsibly," Micallef said. "This is why we feel hard done by the MFA punishment." Earlier, Micallef pledged to do his part to fight corruption in Maltese football. The Marsaxlokk chief also aimed a swipe at those "who are rubbing their hands for using Marsaxlokk to mask their misdemeanours". "The truth will come out eventually," Micallef told reporters. He called on the MFA to keep the Premier League on hold until the whole appeal process is completed. Having reassured the committee members and fans that he will be staying on as club president, Micallef also insisted that Marsaxlokk had no intention of transferring any of their first-team Maltese players, even if their demotion to Division One is confirmed on appeal. Veteran Malta defender Brian Said is the only player whose contract contains a clause allowing him to move to another club in extraordinary circumstances.